Just gorgeous! Will try this one tomorrow! love this piece try this tomorrow. cant wait……. I am wondering what are the sizes of the pearls? It will help, cause it looks like 4 & 6mm pearls. Is this correct? Olga I am your new Biggest Fan, I absolutely love the Ginger design, and am very excited to make my own version, would you mind telling me what size pearls you used? Can someone help me with this pattern? Is this a triangle weave (RAW with 3 beads)of the small pearls then the larger pearls added in a 2nd pass? Thank you! 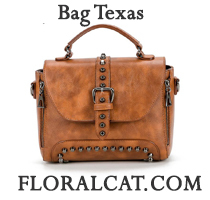 Newer to beading! This pattern is wrong, please correct. I am very interested in this pattern. Can I please have a copy of the correct pattern from you. Can you please me this pattern to my email id. Hi, if your pattern is still available, woul’d you kindly share it to me please? Thank you very much and have a nice xmass week-end! Stephanie could you please send me the pattern for this if you still have it. For this Ginger necklace. Thanks. Could you send me the correct pattern for this necklace. Olga. I would LOVE the correct pattern. I kept looking at this and I knew something about it wasn’t right -It just didn’t make sense. It wasn’t going to look like the same end product. I would really appreciate the CORRECT pattern and I will give you full credit! Could you please send the correct pattern. Hi I just came upon this necklace and want to make it for a wedding, can you please email me the correct Gina pattern? 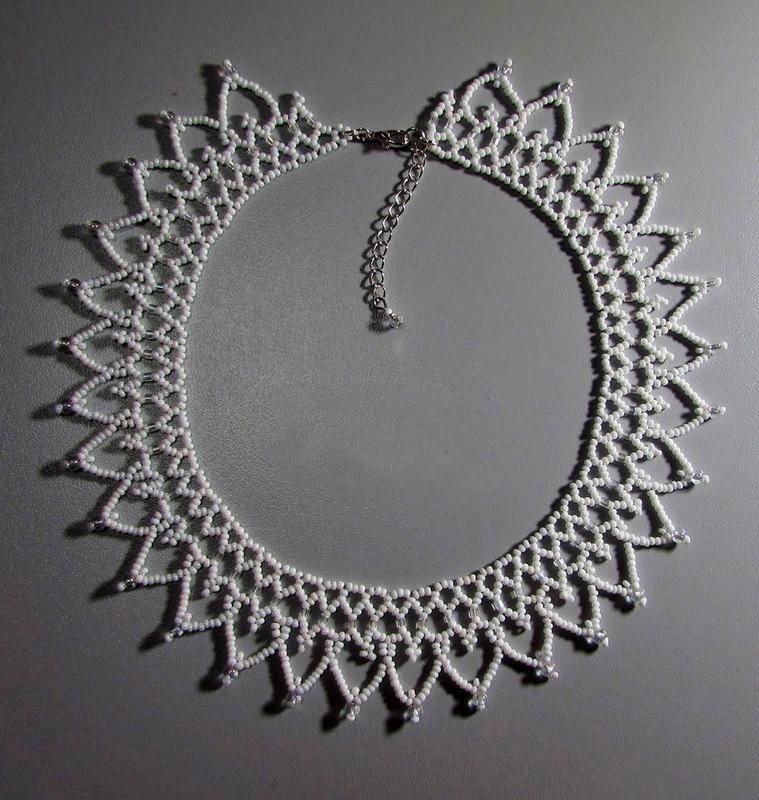 where can i find the correct pattern for this beautiful necklace ? Where can ifind the correct version of this pattern? Can you please post the correct pattern for this necklace, am dying to try it. did anyone found the correct pattern? Stephanie Van, could you please post your version. Thanks. I think all the beads that go to the bottom of the necklace are 6mm where as all others are 4mm. 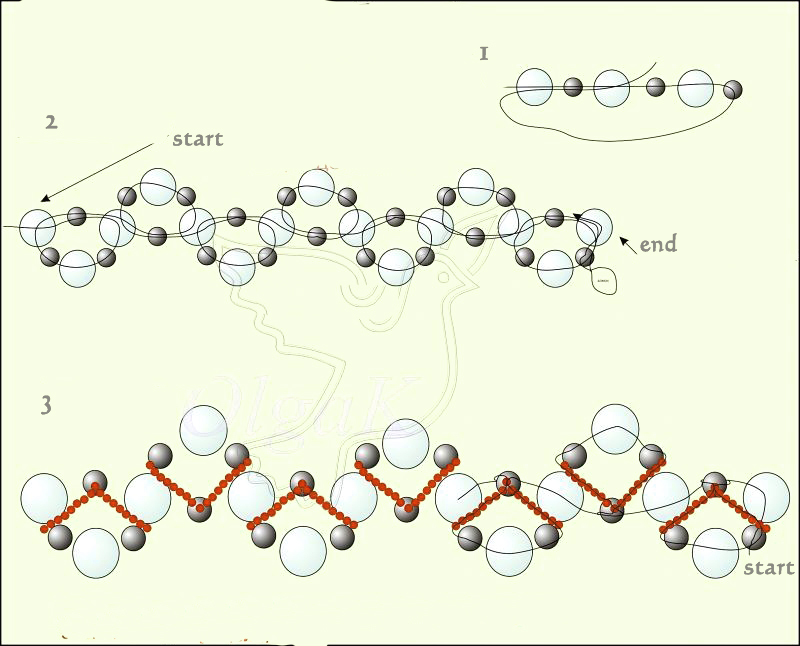 Dark beads in the drawing are seed beads either 11 deg. or 8 deg. I wil try out the pattern to figure it out. No-one has mentioned that the second line of seed beads does not appear in the pattern details. Can anyone help with this ? Olá, adorei o colar, mas o esquema não coincide com o desenho do colar. Será que não foi trocado, por engano? Assim mesmo, vou tentar fazer, pois é lindíssimo. I agree with all of the above. Thank you. M.
The necklace is really pretty but the pattern is confusing.I have worked something like it before but with a single row of seed beads. It is certainly worked differently. Maybe the small beads represent a row of seed beads and the pearls should be placed in such a way that the smaller pearl goes on top. For those who are interested please look up pattern Skyfall of last November 16th. the second row of seed beads can be added at the end. i tnk u all for being kind enough to share these wonderful patterns. Beautiful I’m going to see if I have the beads now. This is beautiful necklace. Can someone share with me the pattern please. 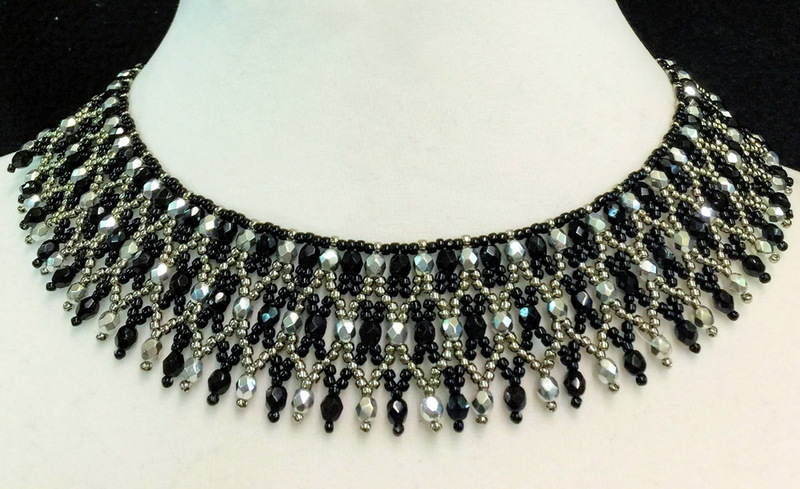 Necklace is very pretty… Can anyone send the correct pattern please?…. My email is [email protected] …… Thanks in advance. Hi! I love this necklace but it doesn’t seem to match the pattern! If you still have it can you send it to me? Thank you! Guy, the pattern is simple. The author just didn’t bother to indicate that the smaller bead is always on the top. 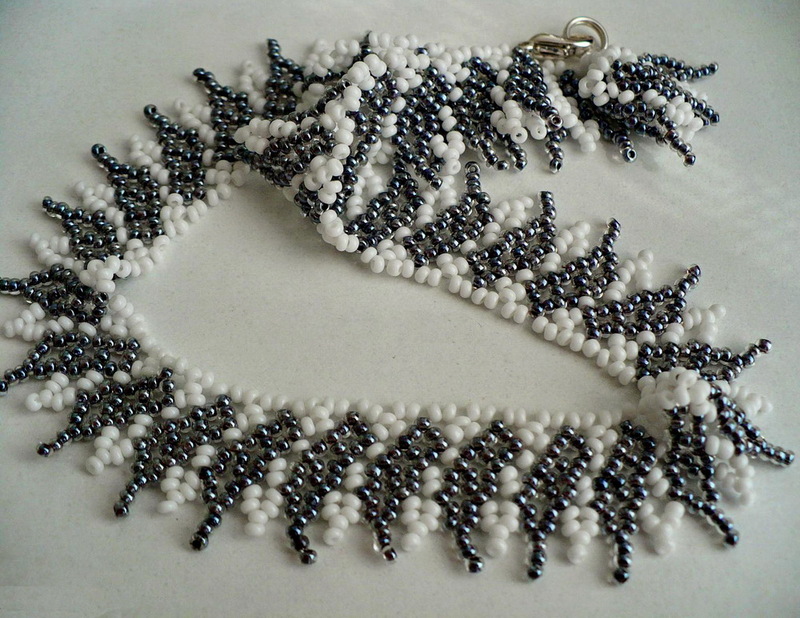 It’s a triangular weave with a seed bead between all the pearls. So you pick up a seed bead, a pearl, a seed bead, a pearl, a seed bead, and a last pearl (always 2 big and a one small pearl) – make a circle. Just watch for the small pearl to be always on top. When you finish this row, put your thread through the seed bead, add 6 or 7 smaller seed beads and go through the next big seed bead, making the nice decoration to your necklace. 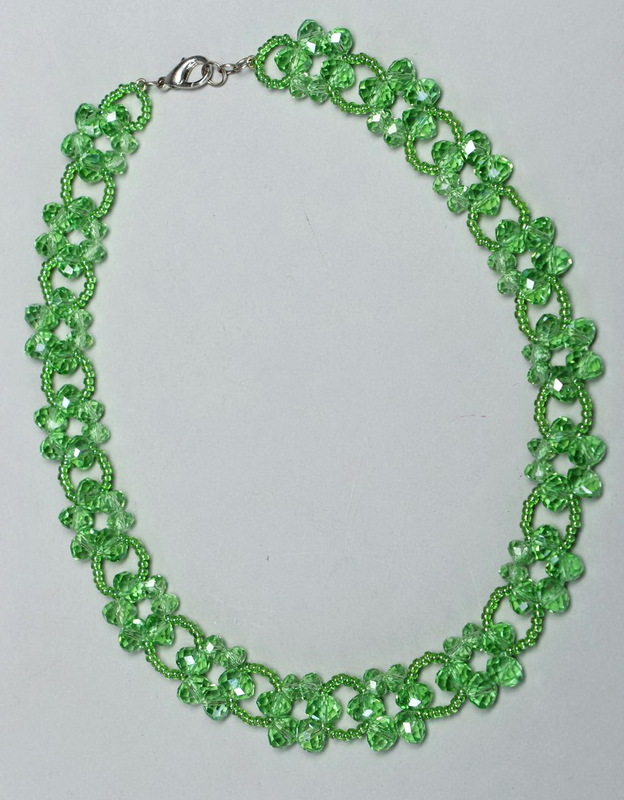 You may add a second row through the same seed beads – I think they are size 8/0. I would use size 11/0 for the first row of decoration and size 15/0 (just more than 7 beads) for the second row. Good luck to all who still wants the answers to this one – I wonder why no one did it before me? Hi, it’s me again. 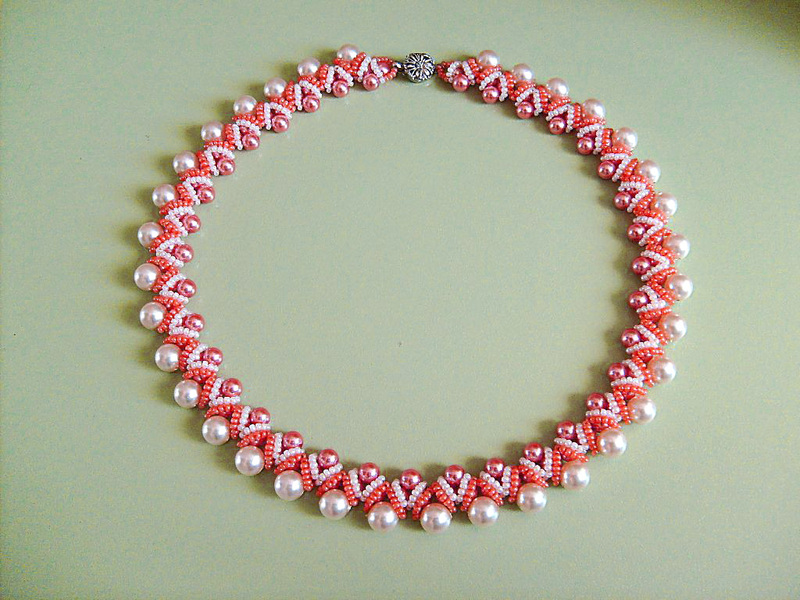 I have just made this necklace with help from the zigzag bracelet video. The first part of the pattern from beads magic is correct. I used two needles rather than one (just my preference). I also used 6mm pearls and 5mm pearls for the smaller beads; also, I used fire line rather than nylon fishing line because it takes a lot of thread and I find it easer to attach more fire line. The second part of the pattern here on beads magic is not very helpful and that’s where the video I mentioned helps a lot. I hope this is as helpful to anybody looking for guidance as it was to me.